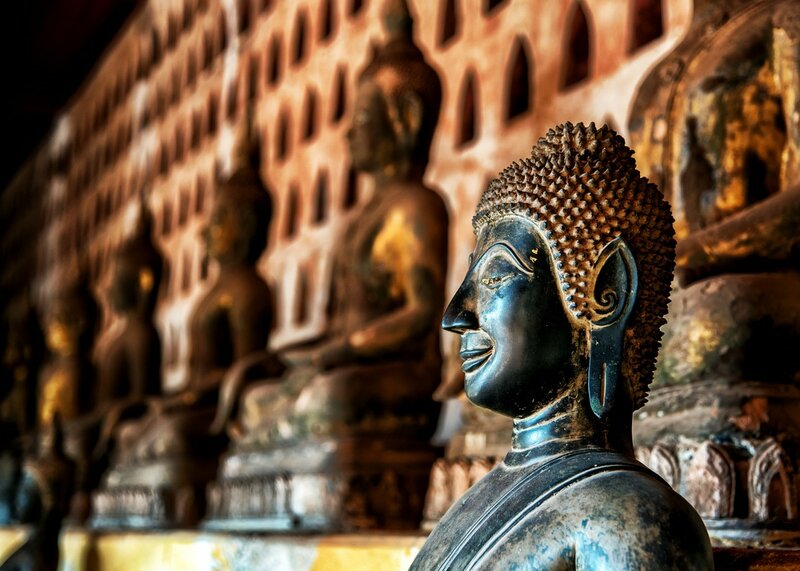 With a population of just under 800,000 people, Vientiane is Laos’ largest city and the nation’s capital. During the era of the Lane Xang Kingdom, in the 14th century, Vientiane was an important administrative center. 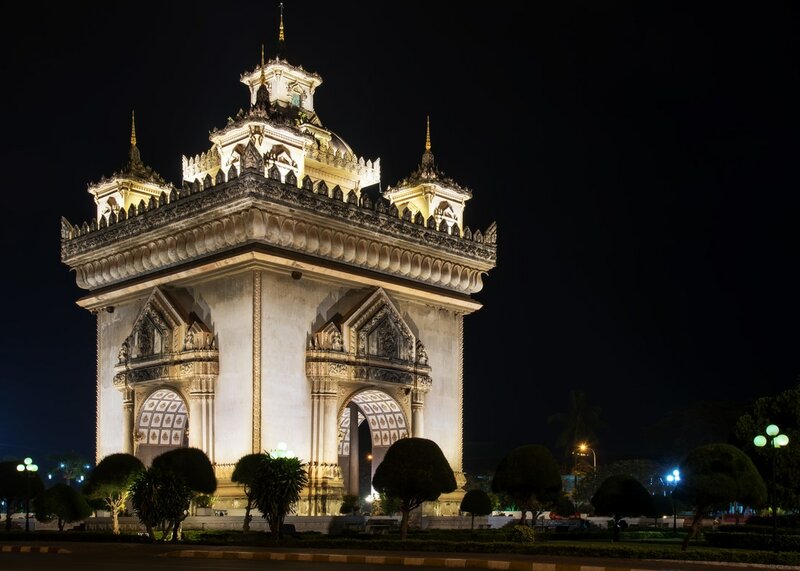 It became the kingdom’s royal capital in 1563 and would remain so until 1827 when it was sacked by the Siamese. In 1893 the French arrived and seized Vientiane and all the territory which had been occupied by the Siamese. Although Luang Prabang remained the royal capital, the French rebuilt the city and made Vientiane their administrative center. The country was essentially a French colony until it was granted independence in 1953. The newly independent nation would become a constitutional monarchy named The Kingdom of Laos. Unfortunately, in the same year, civil war began between the Kingdom and a communist insurgent group knows as the Pathet Lao. Backed by the Viet Minh and later North Vietnam, the Pathet Lao fought against the royal government until December 1975 when the communists declared victory. At the conclusion of the long and costly conflict, Vientiane became the capital of the new Lao People’s Democratic Republic. ​Today Vientiane’s main tourist area is located downtown along a stretch of the Mekong River to the west of Lane Xang Road and north of the night market. In this neighborhood many buildings remain from the French colonial period. The streets are a mix of architectural styles, a blend of old and new, Asian and European. Here travelers will find budget accommodations, restaurants, bars, supermarkets and travel agencies. The area is close to most all of Vientiane’s tourist attractions, many of which are within walking distance. Tuk-tuks are readily available to take visitors to attractions further afield or for inexpensive sightseeing tours. Like their neighbors in Thailand and Cambodia, the majority of Lao people practice Theravada Buddhism. 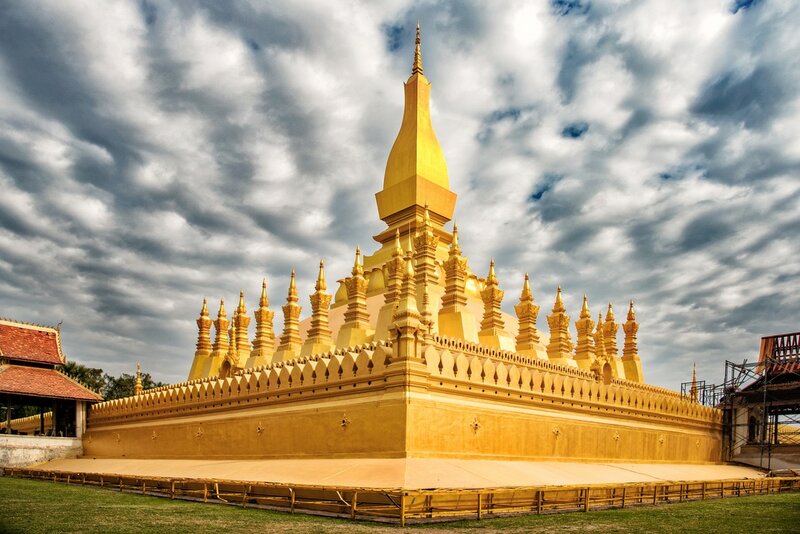 Some of Vientiane’s most popular tourist attractions happen to include the country’s most sacred sites; the gilded temple Pha That Luang, Wat Si Saket and the reclining Buddha image at Wat That Khao. Visitors are encouraged to see these beautiful temples but should always remember that they are active places of worship and that they should dress and behave accordingly. Pha That Luang is considered to be the country’s most sacred temple as it is believed to contain a relic of the Buddha. The original stupa was destroyed by the Siamese in 1827 and rebuilt by the French in the 1930s. One of the few structures to survive the Siamese invasion is Wat Si Saket. The oldest temple in Vientiane, it remains mostly in its original form with the exception of the galleries which have become a museum of sorts that houses over 10,000 Buddha images. Sadly, in 1953 after France granted Laos independence, civil war erupted between the royalist government and communist insurgents known as the Pathet Lao. Originally supported by Viet Minh guerrillas the Pathet Lao ultimately received substantial military assistance from North Vietnam and The People’s Vietnamese Army (PAVN). The famed Ho Chi Minh Trail, a network of roads and trails designed to move people, arms and supplies from North Vietnam to the Viet Cong in South Vietnam, passed through eastern Laos. The PAVN successfully captured and held Laotian territory along the Vietnamese border, later handing the areas over to the Pathet Lao. Although The Kingdom of Laos claimed neutrality during the war between North Vietnam and The United States, by 1960 both the United States and the Soviet Union were deeply involved in a conflict that would come to be known as the “Secret War”. Run by the CIA from 1962-1975, it was called the “Secret War” because the United States never officially acknowledged their military intervention in Laos. In an effort to defeat the Pathet Lao, block the Ho Chi Minh trail and drive the North Vietnamese out of the country, the United States initiated a massive bombing campaign on eastern Laos. A staggering two million tons of bombs were dropped from 1964-1973 earning Laos the distinction of the most heavily bombed country per capita in history. Incredibly it has been estimated that a third of these bombs never exploded. Since the end of the war over 20,000 people have killed or injured from this unexploded ordnance (UXO). One of the many non-governmental agencies (NGO) working to rid Laos of UXO is the Mine Advisory Group (MAG). This non profit-organization has been working in the country since 1994 and has removed and destroyed over 196,000 pieces of UXO. MAG also operates a visitors’ center in Vientiane which we believe should be on every tourist’s itinerary. Working to assist the survivors of UXO explosions is the non-profit organization Cooperative Orthotic and Prosthetic Enterprise (COPE). COPE provides prosthetics and rehabilitation free of charge to anyone in need. COPE also operates a visitors’ center in Vientiane which we highly recommend visiting. The center, often referred to as a museum, gives an excellent overview of the bombing campaign and its deadly legacy. With the center’s professional displays and documentary films, visitors can learn a great detail about the very dangerous task of identifying and disposing of UXO. There is no admission fee but donations are gratefully accepted. ​Vientiane’s Wattay International Airport (VTE) receives daily flights from a number of Southeast Asia’s most popular destinations including Bangkok, Hanoi, Kuala Lumpur, Phnom Penh and Singapore. 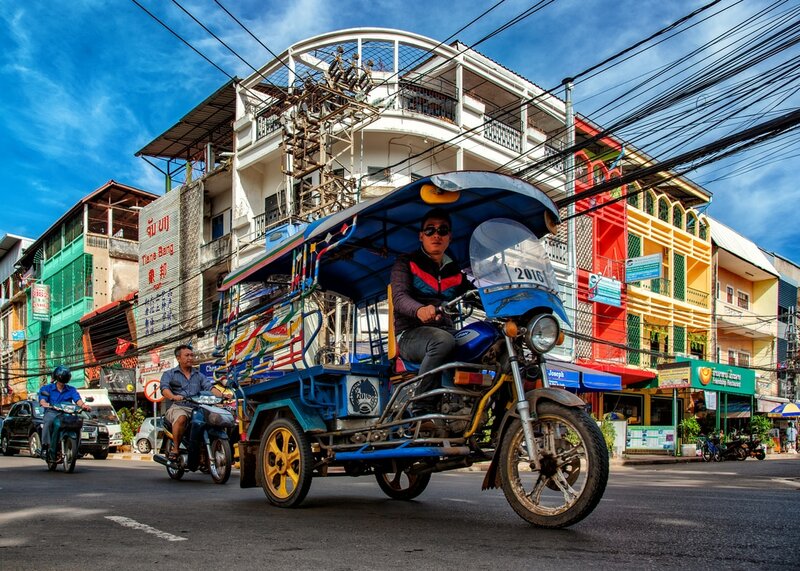 Many travelers doing an overland tour through Southeast Asia will generally either begin or end their visit to Laos in Vientiane. Vientiane is northern Laos’ bus transportation hub. Popular destinations include Veng Vieng, Luang Prabang, Udomxai, Pakse and Savannakhet. International bus travel is available to Cambodia, China, Vietnam and Thailand.